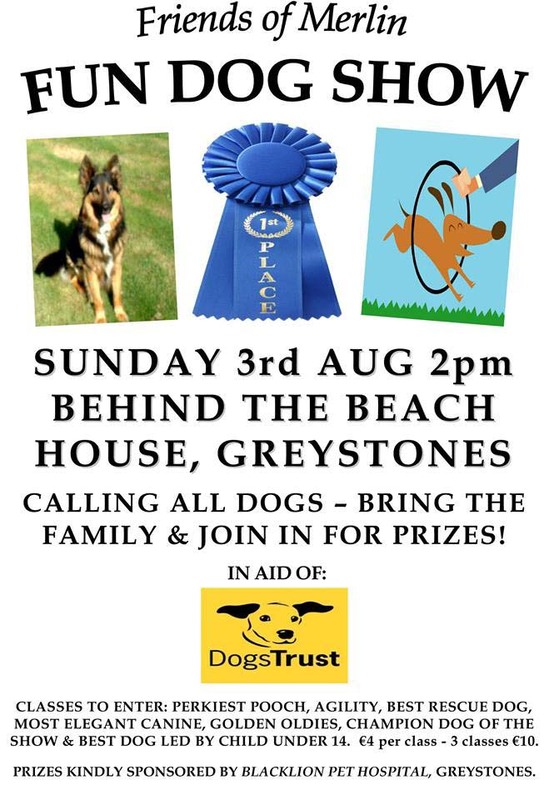 Friends of Merlin will run their second FUN DOG SHOW of the summer, this time in Greystones on Sunday August 3rd, behind the Beach House bar, starting at 2pm in aid of DOGS TRUST. The Greystones show follows the recent Bray show which was a huge success with dozens of entries for all the classes and lots of money raised for Dogs Trust. Classes at the Friends of Merlin FUN DOG SHOW in Greystones on August 3rd cost E4 per class or 3 classes for E10. There will be prizes for winners and runners up kindly supplied by local veterinary practise Blacklion Pet Hospital. Friends of Merlin FUN DOG SHOW on August 3rd will feature several different exciting classes including golden oldies over 8 years old and best dog led by a child under 14 years and the ever popular agility round where owners and dogs get to show off their skills around the ring! The Dog Show is run by Friends of Merlin, a group of local animal lovers led by Jon Jameson who has run the Bray Dog Show for well over a decade and the Greystones Dog Show for the last 22 years. Merlin was rescued about 10 weeks old and lived a long and happy life in the Wicklow countryside. In his lifetime, Merlin was well known in the Co Wicklow area through his educational school visits and parties for students teaching them about animal welfare and the life of a rescue dog.